World Pest Day, also known as World Pest Awareness Day, is observed on June 6 each year. Its main objective is to raise public awareness of the importance of pest management for the protection of public health. More often than not, people associate pests with insects, rodents and birds that cause damage to agriculture. However, in a broad sense, a pest is any living organism (animal, plant or fungus) which is harmful to humans and their habitats, or to wild ecosystems. For instance, pigeons and seagulls are considered pests in some cities because they eat human food and carry disease. Woodpeckers, termites and wood ants cause structural damage to houses; clothes moths, carpet beetles, silverfish and bookworms damage property; mites, ticks, fleas, lice and bed bugs can cause skin irritation. “Pest” is a loose concept because a species can be a pest in one setting but beneficial in another. For example, wild raccoons are an essential part of the ecosystem in their natural habitat, but raccoons living in urban areas are considered to be pests (and dangerous ones because they can carry rabies). So eliminating pest species is not a solution but pest management is. World Pest Day was initiated by the Chinese Control Pest Association in 2017. The initiative was supported by the Confederation of European Pest Management Associations, the National Pest Management Association (United States), and the Federation of Asian and Oceania Pest Managers’ Association. 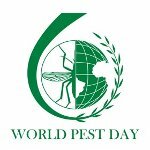 The main goals of World Pest Day are to raise public awareness of the important role of pest management in protecting public health, improve the professional image of the pest management industry, promote the use of professional pest management, and call attention to the big threats caused by small pests.